Mathrubhumi which has already created a space in the reading circle of Kerala is well known for its innovative publications. Being front runner among the dailies with a circulation of 14 lakhs, Mathrubumi plays a key role in building up a generation who keeps high interest in reading. 'Star and Style', the youngster publication from the Mathrubhumi has already reached the hearts of millions of malayali readers who wish to keep themselves updated about the entertainment world. Star and Style is one of the top rated Life Style magazine which focus on film and fashion trends. The highly energetic core team of the magazine should be praised for their innovative approach in delivering content much readable for the present generation. Positioned as a complete film, fashion & Lifestyle Magazine each issue of 'Star and Style' features interviews of highly celebrated artists. Already the magazine carried interesting stories on the important stars of the Malayalam film industry including Mammootty, Mohanlal, Manju Warrier, Kavya Madhavan, Gopika, Dulkar Salman, Pranav Mohanlal, Jayasoorya, Unni Mukundan and many others. A special music edition of the maagazine featured articles on legendary singer Yesudas, Vijay Yesudas, P.Jayachandran, Chithra, M.G.Sreekumar,Sujatha, G.Venugopal Swetha, M.Jayachandran, Vaikkom Vijayalakshmi and Afsal Yousuf. Unlike other magazines of the same genre, 'Star & Style' emphasize on informative columns by eminent personalities on fashion and physical fitness. The makeover of the popular artists truly keeps the readers entertained. 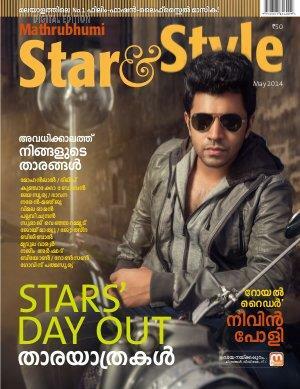 Other regular features of the magazine are Box Office, Cine News, Marumozhi, Star Jam, New Releases and Star Net. It is much interesting to know that the magazine is highly praised among the film industry while the top celebrities update each issue of it. Readers, who are curious to know the trends happening in the filmy and fashion world, wait for the arrival of 'Star & Style' magazine. Through this publication, Mathrubhumi aims to bring to light the latest trends and information mostly accessible to the common man.